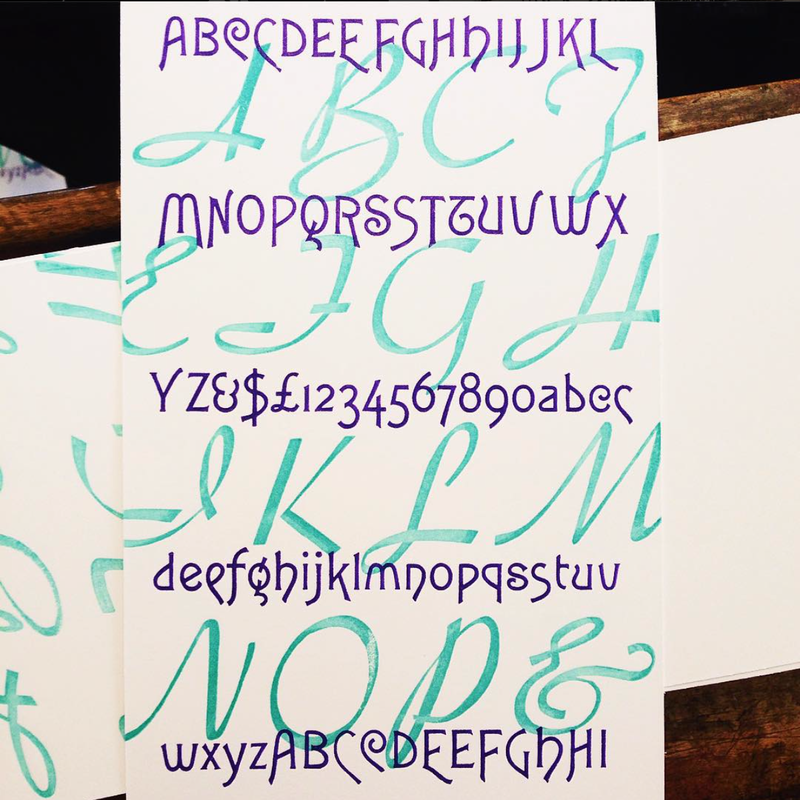 Whether you are new to letterpress or have some experience, come to this workshop and choose wood and metal type, as well as engravings and dingbats to print on the cover of compact notebooks (approx. 6″ x 8″). 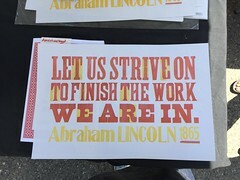 Each participant will learn about setting type as well as get experience with the old-school charm of the letterpress process, and each will be able to print eight notebook covers in one or more ink colors. Very timely for your holiday gift dilemmas! • Print eight notebooks per person, $65. Limited to four people. Thanks to Anne Gelhaus and the San Jose Mercury News for shouting out the 2016 Bay Area Printers’ Faire & Wayzgoose, coming to History San Jose Saturday, April 9! Over 3,000 visitors came to History Park on Sept. 6, 2015 for the San Jose Mini Maker Faire. The Printers’ Guild let visitors of all ages print, score, and die-cut “Type Rocks” pieces with silver ink on dark blue paper. San Jose Printers Guild members helped guests to print coasters at Content Magazine’s CONTENT LAB “Tiki & Typography,” on September 17th at Blanco Square in downtown San Jose. Katie Carter, Katie Hoffman, Bernadette Milan, and Matt Kelsey introduced lots of interested people to letterpress printing on a tabletop press. 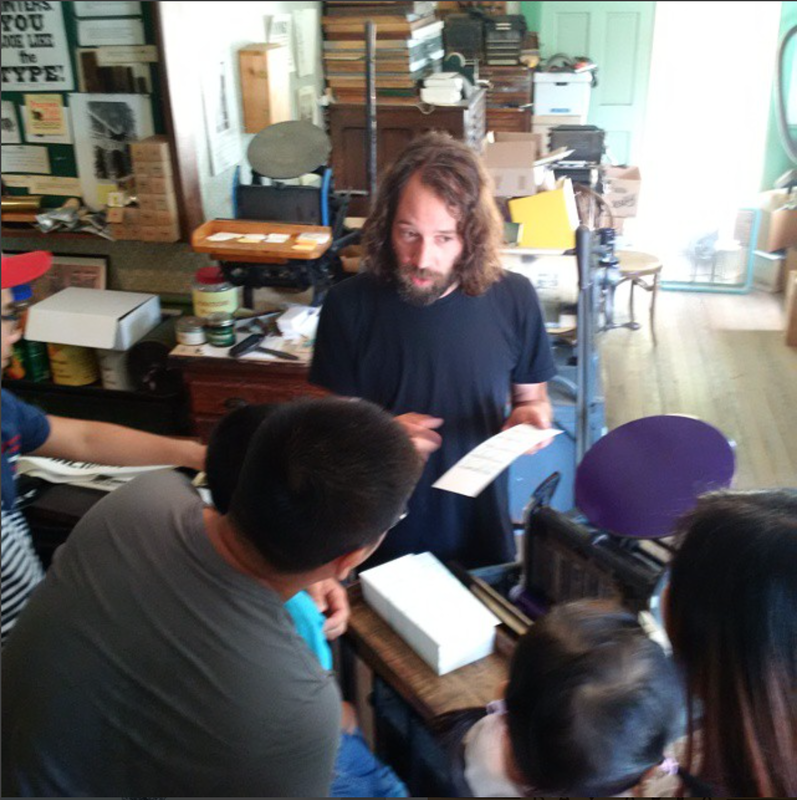 The Itinerant Printer, Chris Fritton, visited the Printers’ Guild at History Park August 28 and 29 as part of his year-long travels to letterpress print shops throughout the US. His journey is supported by an Indiegogo crowdfunding campaign, and he creates postcards and posters to send to his supporters as he goes from shop to shop. At History Park he found some rare wood type that had not been identified, but after printing it and posting on Instagram one of his followers quickly identified it as Trafton Script, a 1930s design. 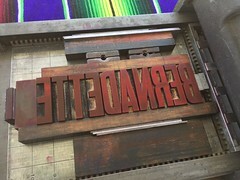 He paired it with another rare typeface, Art Gothic, created in 1887, which the Printers’ Guild has in four sizes, to create a unique postcard that reflects the typographic resources from the print shop at History Park. 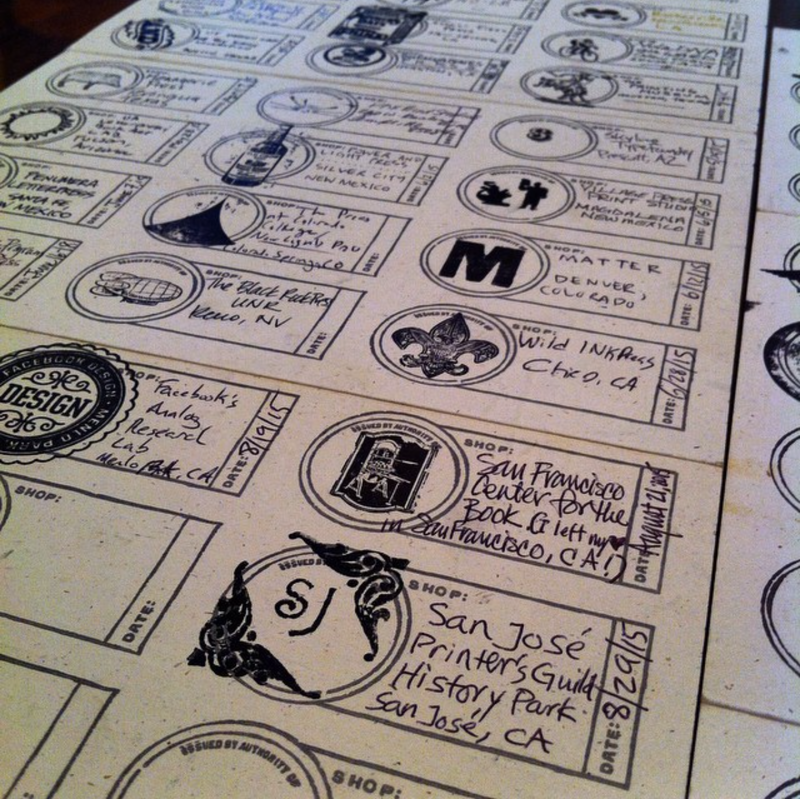 Come to History Park for a hands-on demonstration and meet and greet with The Itinerant Printer, Chris Fritton! 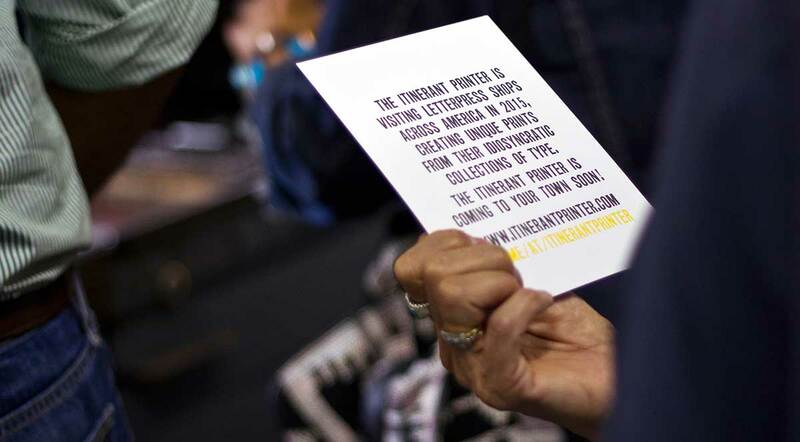 Chris is coming to the letterpress print shop of the San Jose Printers’ Guild in History Park as part of his year-long journey throughout the lower 48 states, covering over 30,000 miles, and creating over 30,000 prints in over 100 letterpress print shops. 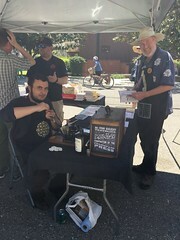 Print with Chris in the print shop from noon to 4:00PM, followed by a presentation at 5:00PM on the museum grounds covering the history and lore of tramp printing, and a reception following with light refreshments. The event is FREE and OPEN TO ALL. Please RSVP to sjprintersguild@gmail.com so we can plan accordingly for refreshments. Also, don’t miss seeing the exhibit Slugs, Dingbats & Tramp Printers: Printing in the Santa Clara Valley, in the Pasetta House at History Park. The exhibit will be open before and after the presentation. And SAVE THE DATE for the 2016 S.F. Bay Area Printers’ Fair & Wayzgoose: April 9, 2016. 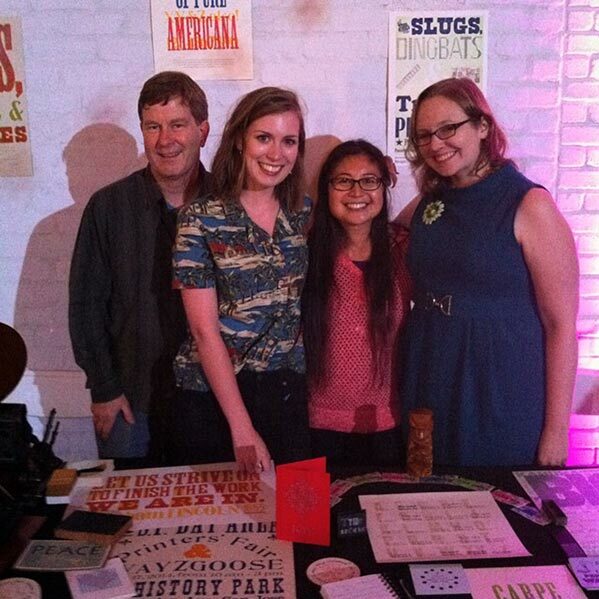 See us at Book Arts Jam Oct. 18th, and Save the Date for 2015 Printers’ Fair! 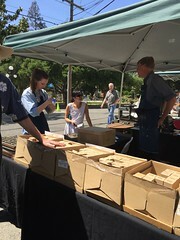 The San Jose Printers’ Guild will be exhibiting at the Book Arts Jam, October 18, 2014, 10am-4pm, Lucie Stern Community Center, 1305 Middlefield Road, Palo Alto, California. Admission & Parking are Free! 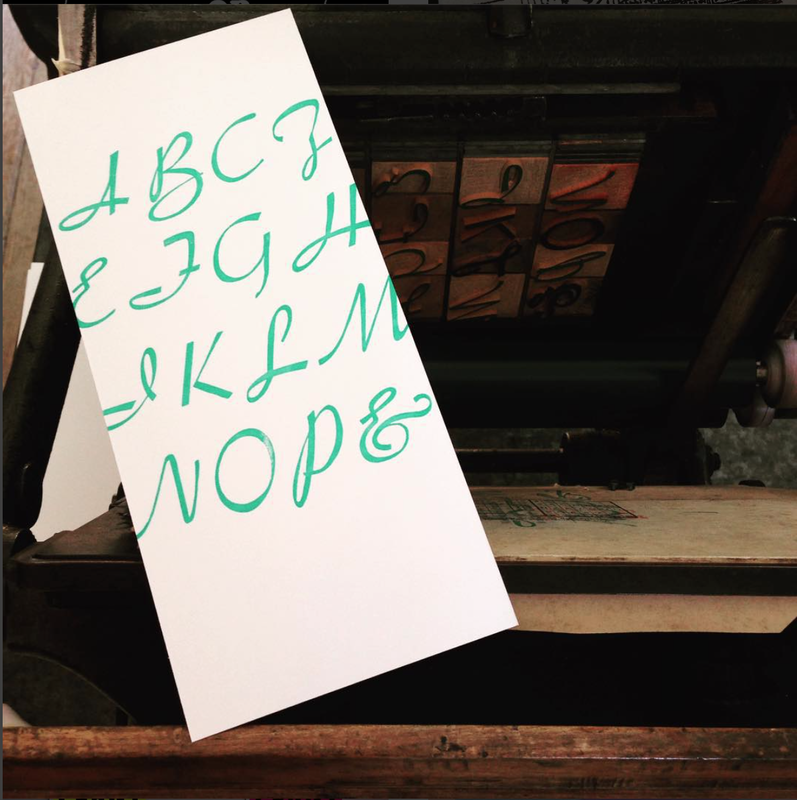 The Guild will have a new collective letterpress-printed book available with your donation, plus you can handset type and imprint your name at the beginning of the book on one of our vintage presses. AND save the date for our 2015 S.F. Bay Area Printers’ Fair & Wayzgoose on April 18, 2015! More info and exhibitor registration will be available by early 2015.